Into Hair: First Time Offer. If you have never had the pleasure of having your hair worked on by one of our talented stylists, we invite you to take advantage of an introductory offer with your first visit to our salon. On your first visit you will receive a 10% off your service. If you return after your first visit you will get a further 5% off your second appointment. After your second visit you will receive a loyalty card and will gain further benefits as a client. Call the salon for an appointment on 01273-737531 or 01273-778444 to book. If you are looking for a colour service we do insist that you have a skin test with us 48 hours prior to your appointment. All you need to do is click the voucher opposite to enlarge and print it out. Bring it in with you. You know it makes sense! 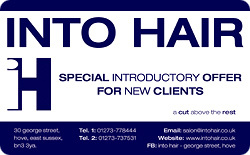 Into Hair, 30 George Street, Hove, East Sussex, BN3 3YA. See maps to find our location.